Last year, we talked about the discovery of eight imposing statues of Sekhmet, all crafted in black-granite, from the Kom El-Hettan site of the Temple of Amenhotep III, on Luxor’s west bank. Well, this year, archaeologists have followed up on their success with a flurry of newer finds entailing at least 27 fragmented statues of the Egyptian lioness goddess, all identified at the same site. 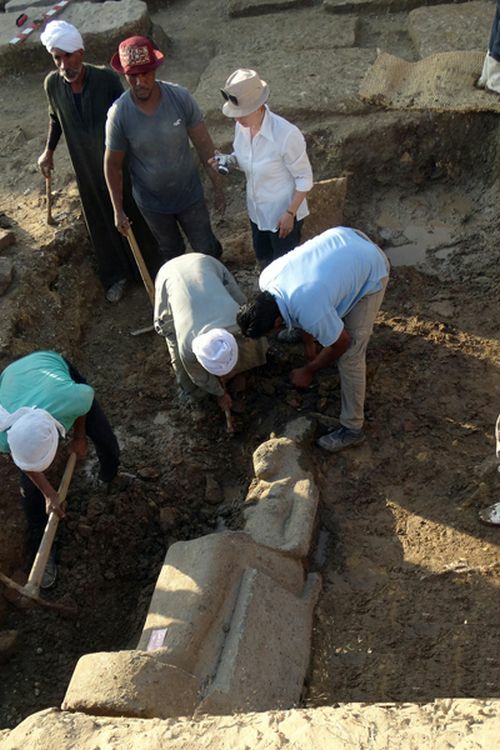 The excavation project was carried out by the joint Egyptian-European archaeological mission, as part of the King Amenhotep III Temple Conservation Project. According to Egypt’s Supreme Council of Antiquities, the statues reach the maximum height of 1.9 m (6.2 ft). Some of them depict Sekhmet in a seated position on a throne, holding the symbol of life in her left hand, while others represent her in a standing posture and saliently holding a papyrus scepter before her chest. And in the usual ancient Egyptian fashion (encompassing the New Kingdom period), the head of the goddess is crowned with a sun-disk, accompanied by a uraeus (Egyptian upright cobra motif) that royally adorns her forehead. Now the good news for history enthusiasts is that most of these almost-intact statues, especially the ones that were buried at a (relatively) shallow level, were found in well-preserved conditions. Furthermore, even after the rigors of three millennia, the artifacts have showcased their fair share of endurance, by virtue of the sturdy black-granite material, complemented by the impressive levels of craftsmanship. 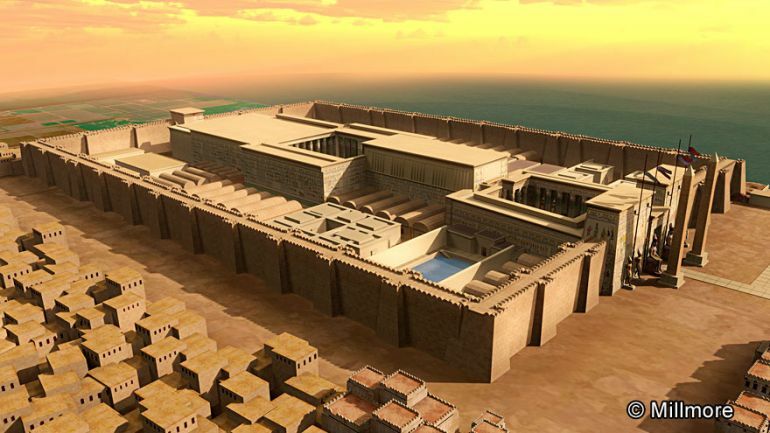 This passage of history also includes an earthquake episode that damaged the Temple of Amenhotep III in circa 1200 BC. And in case one is wondering, the archaeologists have been able to salvage around 287 specimens of Sekhmet statues from the site in the last 19 years. This superlative architectural feat (located in the Theban necropolis, opposite Luxor) originally had an expansive complex that covered an area of more than 350,000 sq m (or 3.8 million sq ft), thus equating to over 65 American football fields! 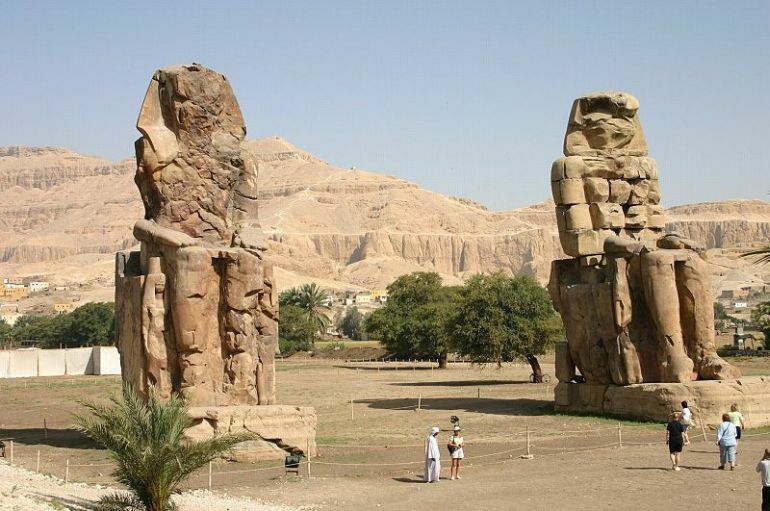 Two imposing statues of Amenhotep (around 60 ft high), collectively known as the Colossi of Memnon (see below), still give us an idea of the sheer scale of this temple complex that has now unfortunately fallen into ruin. But the good news is – conservationists are still looking forth to refurbish what’s left of this monumental site. To that end, these Sekhmet statue specimens would come in handy in drawing visitors to this ancient structure after the temple ruins are properly secured and opened to the public. And when it comes to the grandeur of Egyptian mythology, Sekhmet the Goddess is awe-inspiring with her lioness visage and blood-red clothing. In fact, she was presented with the epithet of ‘Sekhmet the Powerful’, and often depicted as the fiercest hunter in all of Egypt whose very breath formed the desert (while her pedigree was also associated with the Solar deity). Given such regal characteristics, it doesn’t really come as a surprise that many Pharaohs regarded her as their protector in battles. Lastly, reverting to the scope of the discovery itself, the researchers are looking forth to restore the ancient statues, after they are done with the cleaning and desalinating the layers affected by millennia of mud and salt. After the restoration, the statues are expected to be placed in their original locations, once the site has been secured and maintained.